Drawing can be combined with easy Spanish reading for a fun comprehension activity. 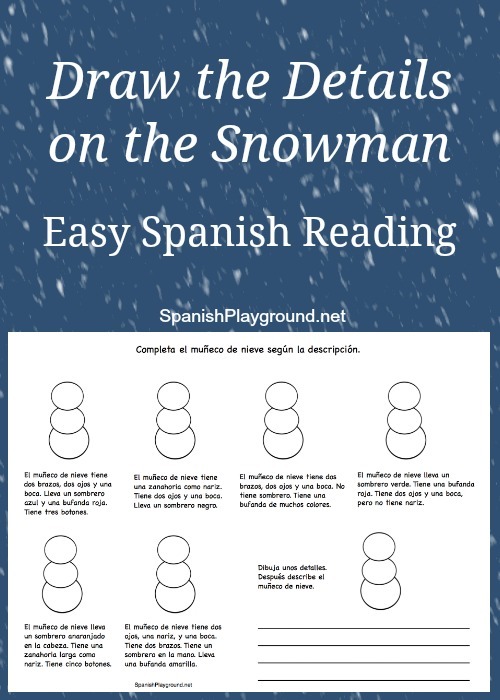 In this printable activity, kids do an easy Spanish reading, a description of a snowman. Then they add the details to a snowman outline. Finally, they choose their own details to draw and write a description of a snowman. There is evidence that drawing is a strong aid to gaining literacy. It is a natural and valuable activity for young language learners. This drawing activity is easy Spanish reading practice for beginners. It uses limited vocabulary with plenty of repetition. You can download the printable using the link below. Visit our reading resource page for many more free printable activities for Spanish reading practice. You do not need a printable page for this kind of easy Spanish reading practice. There are many variations you can do by drawing and writing as you go, on cards, or on a white board. The key is to start with something simple like the snowman. Limit the details you add to easy-to-draw items. See more draw-the-detail activities with a house, a stick figure and pumpkins and skeletons for Halloween. If you have a group, you can do the activity in teams. Make it a relay race where teams read a sentence on a strip of paper and add details to a snowman outline on the board. Make a list of vocabulary that can be added to the snowman. Let kids draw a word or phrase from a jar to draw or for a friend to draw. Put the descriptions on index cards and make the same number of snowman cards. Take a card, read the description, and then add the details to the snowman card. Once you have added the details, you can do the activity in reverse – match the drawings to the correct descriptions. Use the cards with the snowmen and the descriptions to play memory. This makes a great listening activity and a fun pair activity. I have also used drawings as writing prompts. You can adapt easy Spanish reading practice with simple drawings to any skill and level. This is the vocabulary used in the easy Spanish reading printable. There are many other words that you can use with a simple snowman outline. This is a brilliant activity that I’m sure my class will enjoy. They will be motivated to read carefully and also write creatively. Thankyou so much! Great activity. I can’t wait to use it with my students.